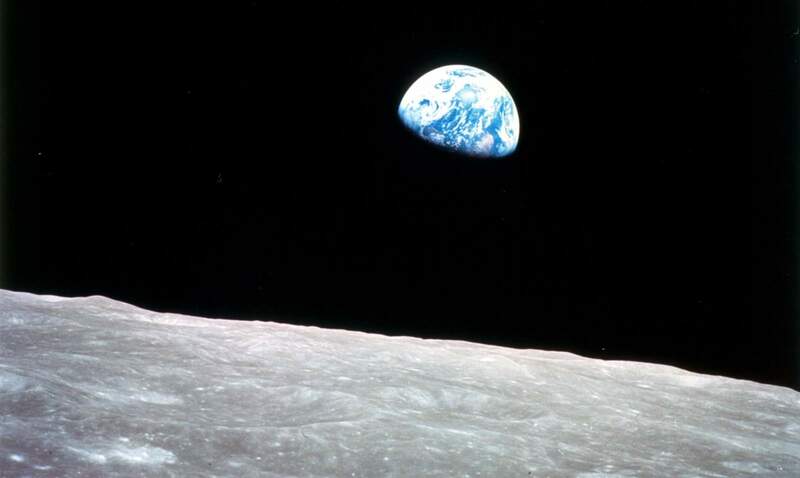 On December 24, 1968, the crew of Apollo 8, the first manned mission to the Moon and the second manned spaceflight mission in the United States Apollo space program, took this photo, later dubbed “Earthrise”. During a broadcast that night, pilot Jim Lovell said: “The vast loneliness is awe-inspiring and it makes you realize just what you have back there on Earth.” This is a cropped image. You can see the full-size image on NASA.gov. AS08-14-2383 (24 Dec. 1968) – The rising Earth is about five degrees above the lunar horizon in this telephoto view taken from the Apollo 8 spacecraft near 110 degrees east longitude. The horizon, about 570 kilometers (350 statute miles) from the spacecraft, is near the eastern limb of the moon as viewed from Earth. The width of the view at the horizon is about 150 kilometers (95 statute miles). On Earth 240,000 statute miles away the sunset terminator crosses Africa. The crew took the photo around 10:40 a.m. Houston time on the morning of Dec.ember 24 and that would make it 15:40 GMT on the same day. The South Pole is in the white area near the left end of the terminator. North and South America are under the clouds. Camera Tilt Mode: High Oblique. Direction: West. Sun Angle: Near SSP Original Film Magazine was labeled B. Camera Data: 70mm Hasselblad. F-Stop: F-5.6;Shutter Speed 1/250; Lens: 250mm. Film Type: Kodak SO-368 Color ASA 64. The photo above is also the first color view of Earth seen from the Moon photographed by a human. Apollo 8 was launched on December 21, 1968 from Cape Kennedy, Fla., and became the first manned spacecraft to leave Earth orbit, reach the Earth’s Moon, orbit it and return safely to Earth. Apollo 8 took three days to travel to the Moon. It orbited ten times over the course of 20 hours. The spacecraft entered lunar orbit on Christmas Eve, Dec. 24, 1968. That evening, the astronauts -Commander Frank Borman (born March 14, 1928), Command Module Pilot Jim Lovell (born March 25, 1928), and Lunar Module Pilot William Anders (born October 17, 1933)- held a live broadcast from lunar orbit, in which they showed pictures of the Earth and moon as seen from their spacecraft. During the 20-hour period in lunar orbit, the crew conducted a full, sleepless schedule of tasks including landmark and landing site tracking, vertical stereo photography, stereo navigation photography and sextant navigation. The three-astronaut crew became the first humans to travel beyond low Earth orbit, the first to see Earth as a whole planet, the first to directly see the far side of the Moon, and then the first to witness Earthrise. It was an important prelude to actually landing on the Moon was testing the flight trajectory and operations for getting there and back. The Apollo 8 astronauts returned to Earth on December 27, 1968, when their spacecraft splashed down in the Northern Pacific Ocean. Here is the edited footage of the Apollo 8 launch, several camera views compiled. Edited footage of the Apollo 8 launch, several camera views compiled. Runs from T-00:25 through T+03:25. See the mighty Saturn V launch vehicle in action, carrying humans for the first time. Watch out for an excellent shot of the staging sequence at the 3 minute mark in the video.